Offered on eBay by seller "G"
Rare ancient egyptian wood carved burial mummy mask with applied pigments and GOLDEN ColoR!. Egypt - Late Period. What a neat item for that Ancient Worlds lover. 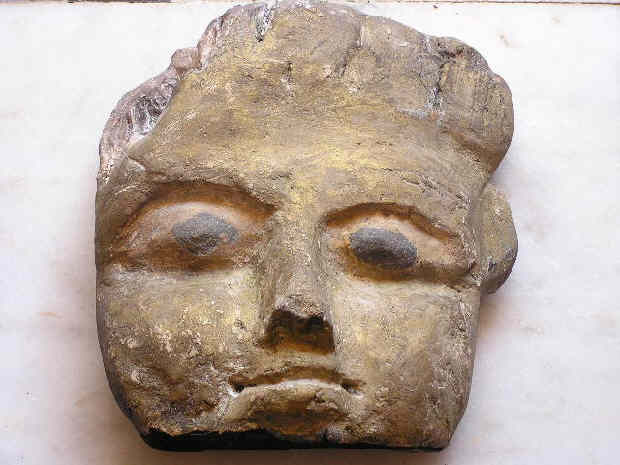 This is a wonderful Ancient Egyptian wooden burial mask also referred to as a mummy mask. This mask was fashioned from a single piece of wood. The condition of this is good considering the age of the piece there is extreme signs of wear,and slight surface cracking can be seen. There are holes in the mask where wooden pegs or dowels would have afixed this mask to the coffin lid. The facial details of this mask are quite impressive. Great care and skill was excercised to make this mask life like. Pigments have been applied to the eyes and the mask has been painted a deep and beautiful golden color. While most objects I list do not have reserves this items is being listed as a store item with a buy it now due to the extremely high value of the piece and a previous offer. You will not find another piece quite as beautiful or detailed. This mask holds an extremely high value and the price is set far below the resale value. This superb piece measures 10.75" by 10" by 5.5" inches.